The Texas brown tarantula is our state's largest spider. Look for it on dry, rocky glades in the southern half of the state. The Texas brown tarantula is a stocky, hairy species and is Missouri's largest spider. The body and legs are uniformly dark chocolate brown, with reddish hairs on the carapace. There are more than 50 species of tarantulas in North America, but this is apparently the only one native to Missouri. Length (not including legs): Females average 2 inches; males about 1½ inches. Video of a Missouri tarantula in the wild. Tarantulas prefer dry rocky glades, where they spend their days in silk-lined burrows in abandoned rodent or reptile tunnels or in other natural cavities. Like many hunting spiders, tarantulas are nocturnal, pursuing insects such as crickets. Tarantulas prefer areas seldom frequented by people. In late summer and fall, Missourians in the southern part of the state may see these large arachnids crossing roads. Tarantulas apparently arrived in this part of the country about 8,000 years ago when the climate was warmer, drier, and more like the desert southwest is today. When the climate here changed again, about 4,000 years ago, and become cooler and wetter, tarantulas were able to remain in the relatively desertlike glade environments where they can be found today. Despite what you might see in horror movies, tarantulas don't spin webs to catch their prey. They walk on the ground and grab insects that they encounter, or that amble past them. Like other spiders, they have fangs that deliver a venom that both subdues their prey and helps digest it. Tarantulas are not aggressive to humans. Remember that almost all spiders use venom to subdue their prey. The venom of tarantulas has no medical significance for humans, being something like a bee sting. 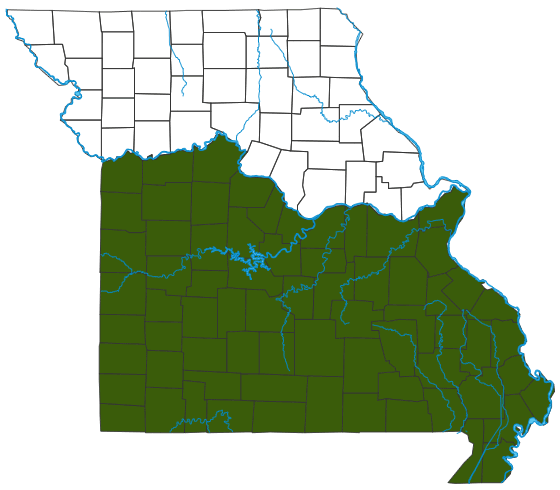 Occurs mainly in south and central Missouri, in appropriate habitats. The Missouri River apparently acts as a barrier to the spider's movement into northern Missouri. Females secure their egg cases in silken webbing attached to the inner walls of their burrows, and they guard the eggs until they hatch. Often, the young stay with the mother for about a week before dispersing. Most of our spiders live for only a single season, but tarantulas can potentially live for years. Females can live for more than thirty years, though males rarely live more than a year. A tarantula's large size and shaggy look scares many people, making them think it has a ferocious nature. But tarantulas are actually quite shy, quick to evade humans. Many people keep tarantulas as pets and feed them crickets, cockroaches, and the like. They are docile and interesting to handle and watch. Spiders are predators that help control the populations of the species they consume. In turn, they feed other predators. The burrows tarantulas inhabit function not only as places to lie in wait for potential meals, but also as refuges from lizards, birds, skunks, and other enemies. Tarantulas that inhabit abandoned rodent or reptile tunnels are connected to those animals for safe burrow habitat.